A bee working diligently in the warm summer afternoon. This must be Nova Scotia’s most dangerous looking plant. If you’ve ever seen one you know exactly what I mean. It obviously doesn’t want to be touched. If you are brave enough you’re rewarded with a painful pricking. This plant was about 5'6". That’s a shame because almost all of this plant is edible. 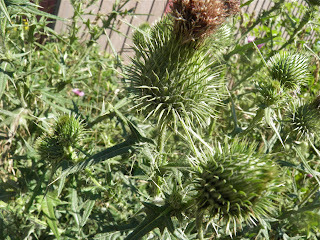 Cirsium vulgare (Spear Thistle) is native to most of Europe, western Asia, and northwestern Africa. 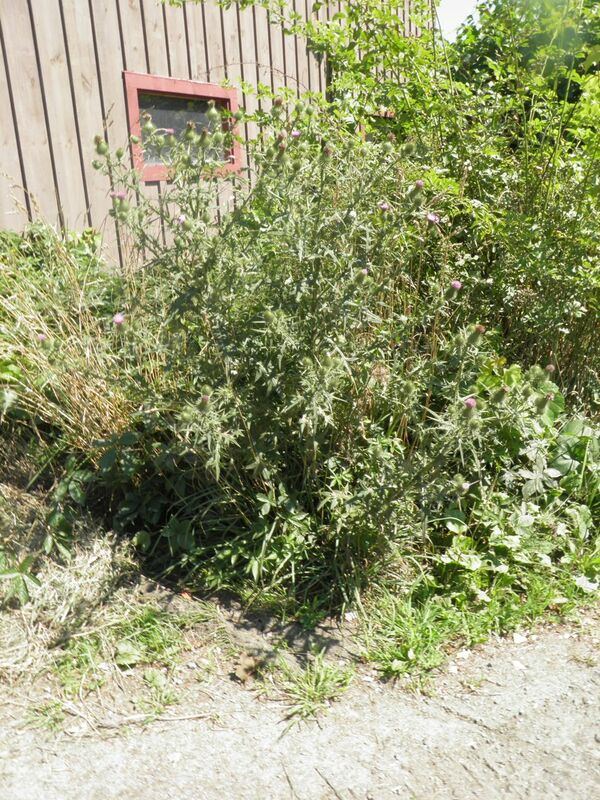 It is naturalized in North America and Australia and is classified an invasive weed in some areas. 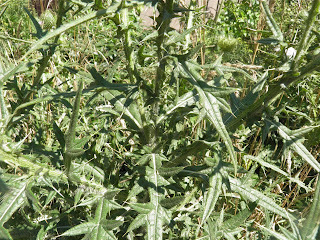 Spear thistle is a tall biennial plant, forming a rosette of leaves and a taproot the first year, and a tall (up to 5’) flowering stem in the second year. The stem has numerous spine-tipped “wings” along its length. The leaves are sturdy, spine-tipped, grey-green, and deeply cut. The spiny leaves are what gives the plant its common name. Spear Thistles like bare disturbed ground but can also be found in the middle of verdant cattle pastures. They stand out because the grass around them is eaten, but the cattle don’t go near the thistles themselves. 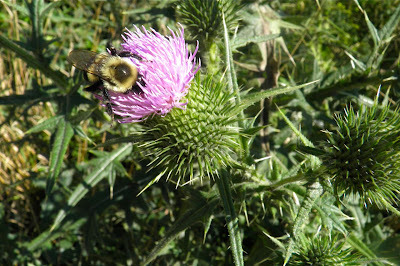 The flower (a standard thistle shape) is between 1-2 inches wide and purple-pink. The seeds have a downy end, which helps them be spread by wind. They are also spread by agricultural activities such as haying. The flowers are loved by butterflies and bees and the seeds are eaten by goldfinches. 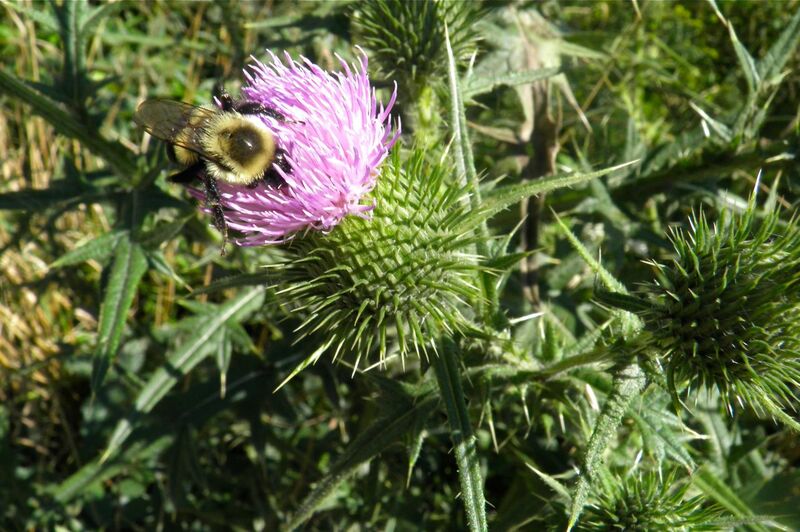 Edible parts of Spear thistle are the flowers, leaves, extracted oil, seeds, root and the stem. Is there anything left? Young flower stems can be cooked and used as a vegetable. Young leaves can be soaked overnight in salt water and then cooked and eaten. Tthe prickles need to be removed from the leaves before the leaves can be eaten which removes much of the leaf in the processing. The flower buds can be cooked and used like globe artichokes, but are significantly smaller. I wouldn’t want to try to make a meal of them, unless you roast them whole. 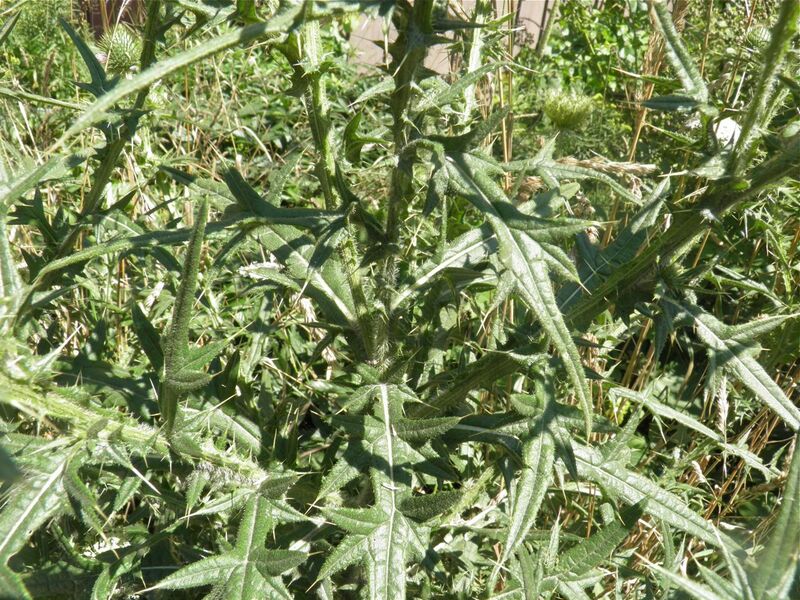 The roots of bull thistle have been used as a poultice for sore jaws. A hot infusion of the whole plant has been used as a herbal steam for treating rheumatic joints. Haemorrhoids have been treated by a decoction (boiled down extraction) of the whole plant,. The seed down as tinder tinder that is easily lit by a spark from a flint. A fibre obtained from the inner bark can be used in making paper. 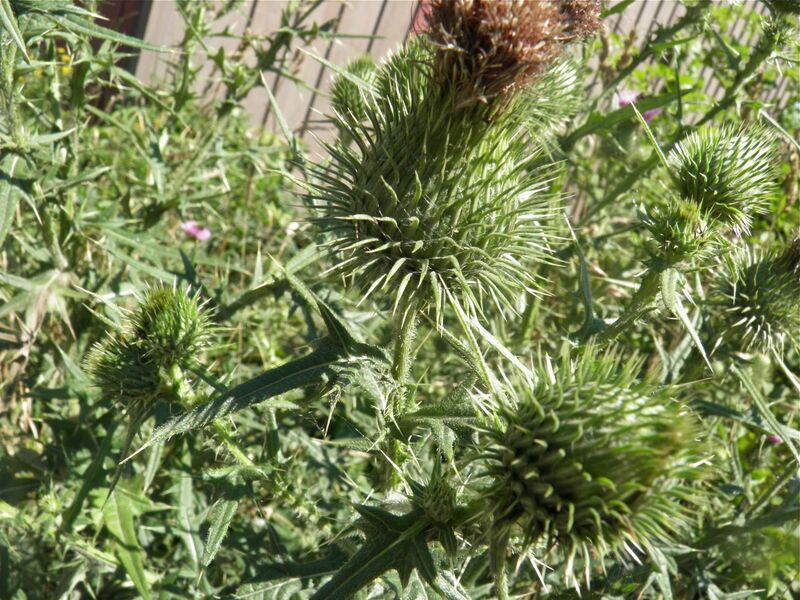 The seed of all thistles yields oil by cold pressing. Even if you don’t use this plant as a forage, it’s a grand thing to come across and could be used to great effect in borders to add interest and height. Just remember that as a biennial you only get stalks every two years, so planting two years in a row would be needed to ensure yearly bloom. can you transplant if this is its first year and it is still close to the ground? Hi. Sorry for the delay in replying. I would assume that you would have better success transplanting a first year one. The only advice I would give is to dig deep and wide around the plant when you lift it. The more fine hairs you keep on the roots the greater chance of success. Although by the look of them, they're pretty tough customers!